¶ 4 Leave a comment on paragraph 4 0 Dylan is beyond all that now, ready to forgive others and – more important – to forgive himself. The tone here is light-years away from “Positively” or “Leopard” or “Absolutely Sweet Marie”. ¶ 5 Leave a comment on paragraph 5 0 Similar to Drifter’s Escape, the narrator of this song is being persecuted unjustly, and again Dylan uses images drawn from the court system. Dylan writes, “Dear Landlord, please don’t dismiss my case”. Drifter’s Escape features both a judge and a jury. John Wesley Harding has “charges held against him”. The Lonesome Hobo has “served time”. ¶ 6 Leave a comment on paragraph 6 0 Everybody that has every written a word about this song has speculated on who the “landlord” might be. 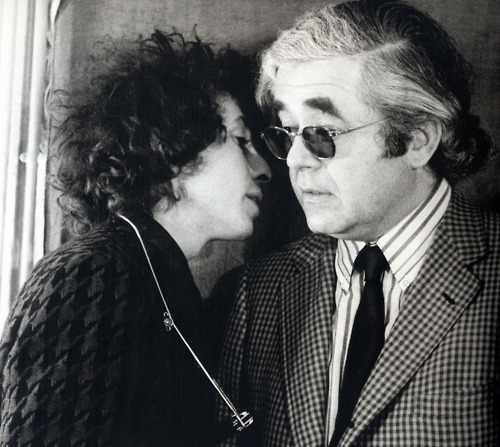 The most common guess is Albert Grossman, Dylan’s manager during the sixties. Although Grossman’s business acumen and strong-armed tactics (documented brilliantly by D.A. Pennebaker in the film Don’t Look Back) played a significant role in Dylan fortunes, they had a bitter falling out sometime before the writing of John Wesley Harding. ¶ 7 Leave a comment on paragraph 7 0 Some evidence suggest that it could really be about Grossman. According to Oliver Trager, Dylan was actually renting a cottage from him in Woodstock, New York when the song was written. So Grossman really was his landlord. Furthermore, Dylan’s record company and the business types, which certainly included Grossman, were pressuring him to release more material, which may have triggered some resentment on Dylan’s part. Dylan has, of course, written songs about specific people who pissed him off, such as Carla Rotolo, the target of Ballad in Plain D. Dylan certainly could have had Grossman in mind, although it seem more likely he was not thinking so specifically, but was rather commenting on class distinction in general (like he does in Maggie’s Farm, for example). ¶ 8 Leave a comment on paragraph 8 0 Dylan does give the thought some credence in a conversation with the notorious Dylanologist, A.J. Weberman. ¶ 9 Leave a comment on paragraph 9 0 [Dear Landlord] wasn’t all the way for Al Grossman. In fact, he wasn’t even in my mind. Only later, when people pointed out to me that the song might’ve been written for Al Grossman, I thought, well, maybe it could’ve been. ¶ 10 Leave a comment on paragraph 10 0 Another popular theory is that the landlord is a substitute for God, as suggested by Wilfrid Mellers in A Darker Shade of Pale. The theory is that Dylan is requesting forgiveness, asking God to not judge him too harshly for his sins. I find this highly improbable. Would as devote a person as Dylan actually refer to God as his “landlord”? I can’t imagine that at all. ¶ 11 Leave a comment on paragraph 11 0 Like most of John Wesley Harding, the song is steeped in religious imagery. Dylan sings, “each of us has his own special gifts”, which echos Corinthians 7:7. “But each of us has his own special gift from God, one of one kind and one of another.” Or maybe the primary influence is Romans 12:6. “We have different gifts, according to the grace given to each of us.” The lines “And anyone can fill his life up/ With things he can see but he just cannot touch” has always seemed to me a warning about the evils of materialism, a theme that is of course found in many parts of the Bible, such as Luke 16:13 – “you cannot serve God and money”. ¶ 12 Leave a comment on paragraph 12 0 Perhaps Dylan had the migrant farmers described in John Steinbeck’s Grapes of Wrath in mind as he wrote this song. Given Woody Guthrie’s influence, and the deep influence John Steinbeck’s book seems to have had on Guthrie, it’s not beyond the realm of possibilities. God know those characters had their problems with “landlords”. ¶ 13 Leave a comment on paragraph 13 0 It possible that Dylan got the line “When I hear that steamboat whistle blow” from Steamboat Whistle Blues, recorded by his old favorite, Roy Acuff, back in the thirties. ¶ 14 Leave a comment on paragraph 14 0 Dylan plays the piano on this song, which at this point in Dylan career was relatively rare (Black Crow Blues, If You Gotta Go, Go Now, Ballad of a Thin Man, probably a few others). Dylan’s piano playing is, generally speaking, not subtle. But not so on this song. Dylan tinkles the ivories fluently, with subtle flourishes to finish off each stanza. He plays in a similar fluid fashion on the recently released Spanish Is a Loving Tongue from Another Self Portrait. ¶ 15 Leave a comment on paragraph 15 0 Dear Landlord doesn’t appear to be a favorite of Dylan’s. He played it during his fall 1992 Never Ending Tour and again in 2003. He’s only played it six times total. ¶ 16 Leave a comment on paragraph 16 0 Like most Dylan songs, several artists have done cover versions. Joe Cocker give is a more insistent, rock treatment. Sandy Denny and Fairport Convention retain the feel of the original. Janis Joplin gives it the usual Joplin treatment.